As with any wayfinding design or space planning project, developing a signage strategy requires the right preparation to ensure that your efforts will help people get the most out of their visit to your library. 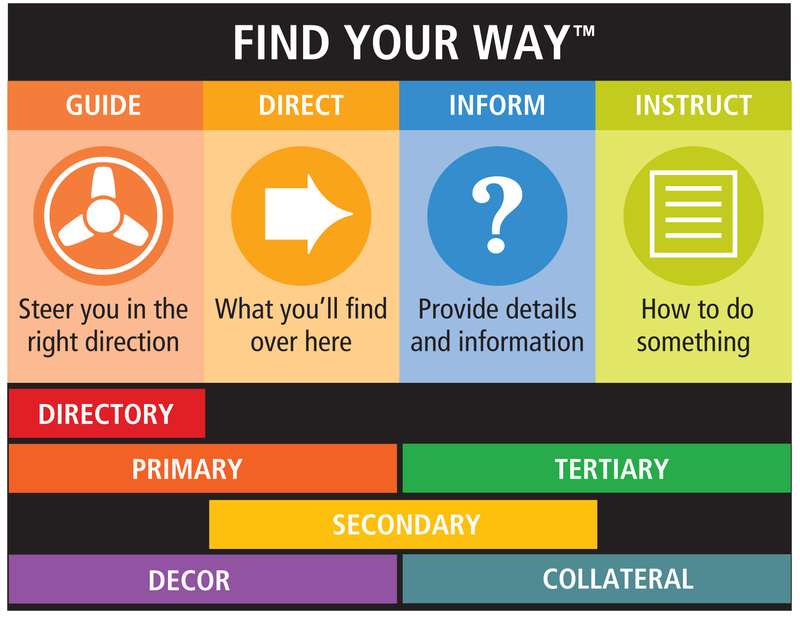 The first step in the process of developing a wayfinding design strategy is to observe your customers to see how they maneuver through your space, where they pause to look for clues to take them to their desired destination. A great way to gather this information is to track the paths different types of users take during their visits. It’s important to not only track frequent library users, but also new and occasional users. 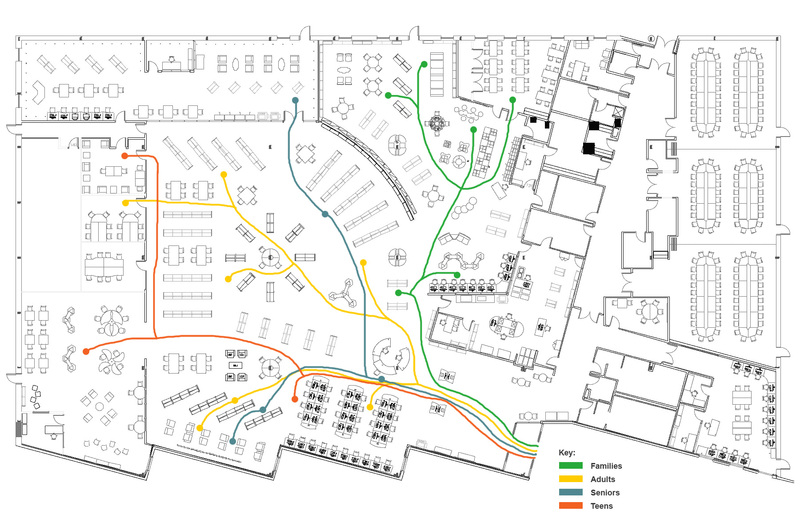 Discretely follow users, marking a floor plan as they walk through the space, noting where they pause and browse. Repeat this process over until you have a good cross section of different users represented. Note on the floor plan the time of day and category of customer you’re observing. This may indicate differences for daytime vs. night time and weekend users. This repetition will be most beneficial in determining how to design your signage plan. Once you have a variety of paths, overlay them to see where there are consistencies and differences. Are families less likely to stop at the service desk to ask for help? Is a particular group more likely to take a less direct path? Do the majority of your visitors stop at a specific spot to gather their bearings? 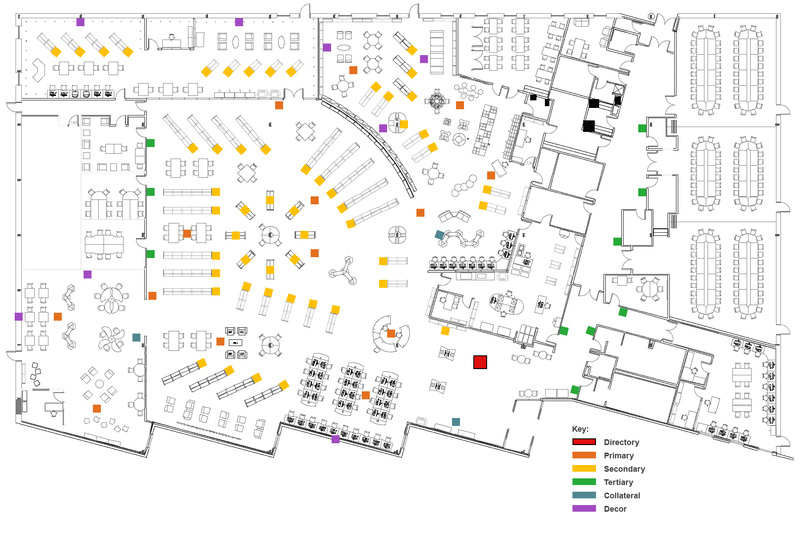 Figure 1 shows an example of an overlay floor plan featuring four different user groups: families, seniors, teens and adults. Based on your demographics, you may choose to feature different groups. Referencing your plan, walk through the space and take lots of pictures. These pictures will be helpful when the time comes to make decisions regarding the design features of each sign. During this phase, users will not be your only assets. Involve various staff members to get multiple perspectives and be sure to engage with staff throughout the entire planning process. There are 6 types of signs needed in a signage plan; Directory, Primary, Secondary, Tertiary, Collateral and Decor. Within each category there are multiple types and applications. As a result, the hierarchy of signage is not only determined by its category but also by its function. Therefore, within each category, there will be varying levels of importance that will influence the design features of each sign. In STEP 2, you will generate another floor plan that details where each type of sign is needed to improve a customer’s interaction with the space. Through the lens of what you learned about your users in STEP 1, mark possible locations for each type of sign on a floor plan. This is a process that you may need to repeat to ensure that the result isn’t signage overkill. Figure 2 is an example of a signage hierarchy plan. This is an example of guiding signage used to steer people in the right direction. Where did everyone stop and look for clues? This is probably a good location for directory type signage. Whether it is a color coded map or a list of different areas, a good directory located where visitor pause naturally will help them to quickly familiarize themselves with your library and gather their bearings. Depending on the number of entrances and floors you may need more that 1 location for clear directory signage. Primary signage falls into both the guiding and directing category of signage. An overhead banner guides visitors in the right direction but also directs them to what they will find over here. It’s very easy to have primary signage overkill, so it’s important to set a variety of levels of primary signage. Entries in to specialty areas like the TEEN SPACE, CHILDREN’S AREA or LOCAL HISTORY should have similar characteristics and perhaps be more prominent than primary signage that is highlighting a specific zone within a larger area. For example, the entry and columns that greet visitors into the teen and children’s space may be large painted murals or 3D sculptured signs, while simple overhead banner call out a FICTION, NON-FICTION areas and/or QUIET ZONES vs. COLLABORATION SPACES. In a library setting, secondary signage is similar to primary signage in that a variety of applications will be represented in the category. As a result, it’s important to develop a hierarchy of signage within the category in order to avoid message overload and clutter. Secondary signage differs from primary signage in that it not only directs but also informs by providing more details and information. In today’s libraries with more focus being placed on content creation and services, there is a greater need for secondary signage to feature these services. Setting similar characteristics for signage that highlight help desks, self-check stations, charging stations and meeting rooms, will help users identify these services. Every shelving unit should have some form of secondary signage, whether your collection is arranged using a category method or the Dewey Decimal system. Secondary signage is important in helping to merchandise your collections. Tertiary signs refer to utility or ADA designation for rooms and are classified as informing and instructing signs. Many of these signs will be required by code and have specific requirements as such. Tertiary signs should be used to identify most rooms. However, if the location of the restrooms or study rooms is not intuitive within your library, placing secondary directing signage in key locations will be helpful. Collateral signage also falls in the category of informing and instructing. Creating a command center for collateral such as program flyers, calendars and brochures will not only help manage clutter, but also let users know where to go to learn more about upcoming events. Remember that less is more with signage. A well organized command center that’s easily identified will be seen and utilized. Using digital signage to showcase upcoming event information along with a tackboard and pamphlet display near the entrances of key functional areas makes it easier for users to learn about all the programs and services you offer and plan their next visit. Digital wallpaper, murals, inspirational words and even a boldly painted accent wall can be very effective tools in your signage strategy. These features can provide visual cues using color and imagery to guide and direct users through your space. Large 3D letters spelling out the words “play” and “explore” or a colorful animated mural are clear clues that this is an area for your youngest users. On the other hand, large black and white photography of historic places will help to identify the LOCAL HISTORY area. Keep architectural features, such as columns, in mind as you walk through your floor plan. Investing the time to conduct your observation exercise will undoubtedly have a significant impact on the customer experience. Putting your lessons learned into practice through consistent messaging will welcome users and nonusers, aide in their navigation and encourage them to return. Effective signage can also be invaluable in exposing users to a broader array of your services. In short, taking the time to learn and plan will pay dividends long into the future. This is the third of a 4-part series on library wayfinding and signage from Demco. Growth Strategy Manager at Demco, Inc.
Angie is the Growth Strategy Manager at Demco. She focuses on the evolving needs and trends in education and library environments, their patrons and communities, and translating these into relevant products and services. She has an extensive background in new product development, product management and business process improvement. Marisa currently works as a consultant on dozens of library space planning and furniture design projects as an associate of Kimberly Bolan and Associates. Previously, she was the Marketing Manager for DEMCO Interiors and continues to consult with the DEMCO Interiors project team through design and furniture specification stages of their large projects. Additionally, she manages DEMCO Interiors' contact programs for architects, designers and consultants and has written several articles on current library trends, space planning and design for libraries. Her experience includes extensive background in product development, furniture project sales and architect and design market relationship development. This has given Marisa in-depth understanding of libraries, their spaces and the furniture needs.